Plants can be beautiful and enrich our environment, providing food, medicine and animal habitat; preventing soil run-off; and absorbing excess CO2 that warms the planet. 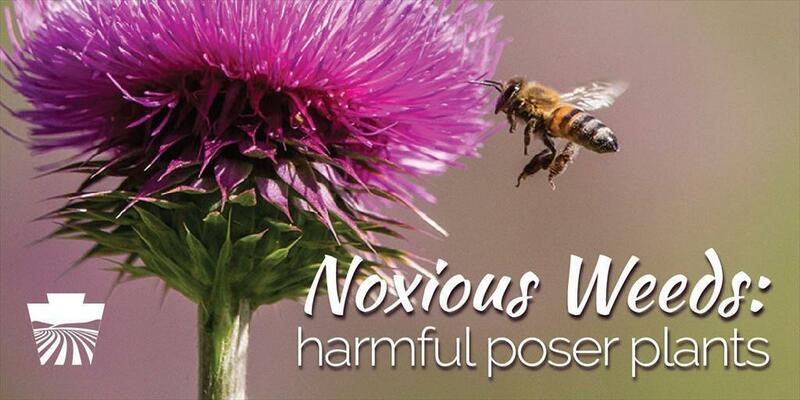 Noxious weeds pose as deceptively attractive plants, but they can do immense harm. They can overtake ecosystems, choking out native plants and animals, clogging waterways and filtration systems, and irritating or poisoning anyone who touches them. In some instances, there are plants that have economic or medicinal value if managed properly, but if not, they can become noxious weeds and invasive species. The Department of Agriculture promotes the sale of beneficial plants. We take a proactive approach to controlling noxious weeds and invasive species, and we try to keep those that could become harmful out of Pennsylvania. The Bureau of Plant Industry’s Noxious, Invasive and Poisonous Plant Program implements federal and state eradication and control programs when a noxious weed in the commonwealth is targeted by federal or state funding for suppression, control or eradication. Over the coming weeks, on the department Facebook and Twitter ​accounts, we will post descriptions of the above noxious weeds in Pennsylvania, along with information on how to avoid being harmed by those that are poisonous or irritating and how to eliminate them or prevent them from spreading. Stay tuned, and learn how to help us keep Pennsylvania green and growing!